Two research groups have independently reported new findings on the mechanism of action of an important class of antidepressant drugs. The work provides key insights into how tricyclic antidepressants interfere with neurophysiology at the molecular scale, and could eventually open the way to the development of more efficient therapies. Tricyclic antidepressants (TCAs) are molecules that resemble a kite, with a central seven-membered ring trailing a short tail and flanked by two benzene rings. TCAs work by inhibiting neurons from taking up the monoamine neurotransmitters serotonin, norepinephrine and dopamine, which regulate mood. 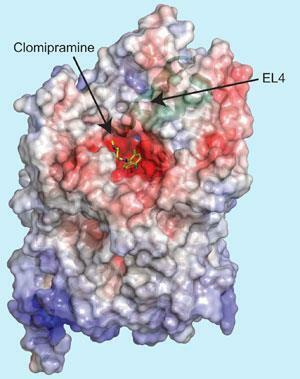 By blocking the re-uptake of these transmitters by their specific transporter proteins, the transmitter molecules remain in circulation for longer, prolonging their action. However, the precise way in which the drugs work had remained unresolved. Now, Maarten Reith, Da-Neng Wang and colleagues1 at the New York University School of Medicine, US, and a team led by Eric Gouaux2 at the Oregon Health and Science University, US, have independently provided data on how TCA molecules bind to a bacterial analogue of a mammalian neurotransmitter transporter. Both groups of researchers used the leucine transporter protein from the bacterium Aquifex aeolicus, which is similar to human neurotransmitter transporters. Zhou’s team crystallized the protein while it was bound to the TCA desipramine; Gouaux’s group used clomipramine. Structural crystallography data on the complexes revealed that the drugs occupy a cavity, referred to as an extracellular vestibule, within the transporter protein adjacent to the point where the substrate - in this case leucine - binds. Once docked into the cavity, the TCA molecule forms ionic bonds with the protein and induces subtle structural alterations that effectively close the ’gate’ that would allow the leucine to vacate the protein. With the substrate locked in place, the transporter cannot do its job. ’By directly locking the gate, desipramine prevents conformational changes and blocks substrate transport,’ Zhou’s team report. ’These papers describe for the first time the mechanism by which antidepressants are likely to block reuptake of neurotransmitters at specific transporters, such as the serotonin transporter,’ said Katherine Aitchison, of the Institute of Psychiatry at King’s College London.